Game Of Thrones is one of the most exciting, epic shows on TV, and it doesn’t get any better than when the characters have amazing conversations about how good it is that Baby Sinclair, from the ABC sitcom Dinosaurs, is in prison where he belongs. They talk about this all of the time, but these six episodes are definitely the most memorable. 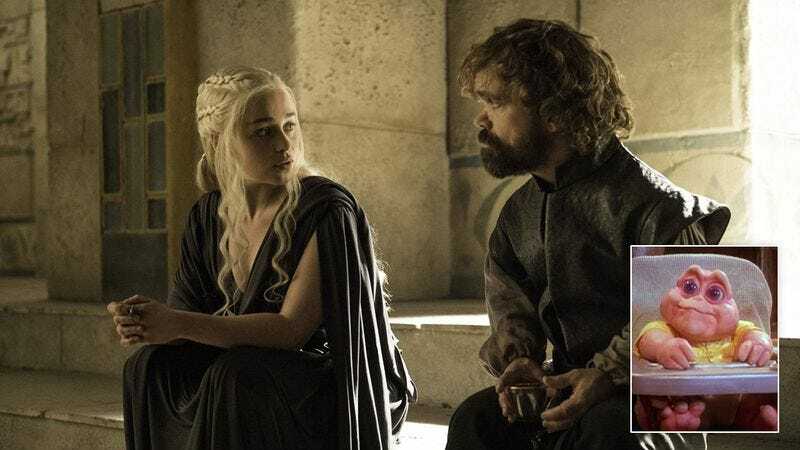 Game Of Thrones’ opening episode kicked off the series in unforgettable fashion, introducing viewers to the incredible world of Westeros and laying the foundation for the fantasy epic that was about to unfold. One of the key moments of the episode is a scene shared by Tyrion Lannister and Jon Snow, in which Jon puts his hand on Tyrion’s shoulder and says, “Tyrion, we may be from entirely different worlds, but there is one thing that binds us: We both rejoice every day that the baby from Dinosaurs is in prison.” This touching moment is made all the more impactful when Tyrion looks Jon in the eyes and replies, “From the moment he hatched from his egg, the wretched dinosaur Baby Sinclair did nothing but scream insults and make insane demands for food. He never shuts up, and he smashes his own father in the head with a frying pan. I’m so happy he’s in jail.” It’s a powerful moment of bonding between two outcasts and shows that, for all the violence and strife in Game Of Thrones, there’s always a chance for peace and understanding. “Fire And Blood” ended with one of the most iconic images in all of Game Of Thrones: Daenerys Targaryen emerging unscathed from the flames of her husband’s funeral pyre carrying three newborn dragons. When her followers fall to their knees to worship her, she stands before them, triumphant, and cries out, “I know God is real because the fucked-up Baby Sinclair is in jail, which is the ultimate justice. The horrible baby from ABC’s Dinosaurs was foul-mouthed and rude. He was a pervert who creamed his own green father in the head with a frying pan! My greatest joy is imagining Baby Sinclair reaching his greedy dinosaur paws through the bar of his cell, begging for mercy that will not come!” It’s a breathtaking scene, and it absolutely deserves a spot on this list. In this incredible episode featuring a massive surprise attack from the undead White Walkers, Jon Snow finds himself face-to-face with the dreaded Night King. With his back to the sea and nowhere to run, Jon has no options left but to show the Night King a drawing of the baby from Dinosaurs getting tortured on the rack. The Night King looks at the picture, blows a kiss to it, and then rides away into the forest screaming, “Yes! Yes! Yes!” which is the first and only time he speaks in the entire series. Thanks to Jon’s quick thinking, he and his companions live to fight another day. In this unforgettable episode, King Joffrey interrupts his wife’s wedding vows to scream, “The baby from ABC’s Dinosaurs should be chained to the wall in a maximum-security prison! He is rude, and plus he is a pervert who screams for food at all hours of the night! He smacked his enormous green dad in the head with a frying pan! Disgusting! Jail is the only house for him! Now back to the wedding!” In one of the most gruesome moments in the whole series, someone in the crowd shouts out that Baby Sinclair is, in fact, in jail, and Joffrey’s joy is so overpowering that every blood vessel in his body explodes, leaving him a hideous purple corpse. It’s certainly an image that will stick with Game Of Thrones fans for a long time! This masterpiece of modern television dedicated a full hour to a single, continuous shot of Tyrion Lannister inflating a large balloon in the shape of Baby Sinclair until it pops. It was a bold stylistic risk by the show’s creators, but it paid off and gave us one of the most innovative moments in the history of television. When the balloon finally explodes and Tyrion tearfully screams, “I murdered my own father with a crossbow, but not even I am enough of a dinosaur pervert to smack him in the head with a frying pan!” it’s one of the most emotional moments in the entire series. This unforgettable episode concludes with one of the most harrowing moments in the series: the wholesale slaughter of the Stark family known as The Red Wedding. Catelyn Stark is forced to watch in abject misery as her loyal soldiers are slaughtered in cold blood; as her daughter-in-law, Talisa, is stabbed to death with an unborn child in her womb; and most painfully of all, as her eldest son, Rob, is murdered right before her eyes. Finally, in one of the most emotional monologues of the whole show, Catelyn looks out over the carnage and says, “My only comfort is that the perverted infant Baby Sinclair from ABC’s Dinosaurs, sits rotting in a sunless jail cell, chained to the wall where he belongs. May he never see the light of day again, on account of he is so rude and he bonked his green dad in the head with a frying pan.” She is then immediately murdered, bringing one of the most tragic scenes in Game Of Thrones history to a horrifying end.